Signs And Wonders is a vertical transect through time and through the natural world. 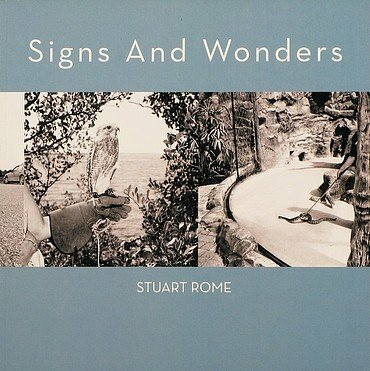 Stuart Rome’s images condense, flatten and compress the multitude of subtle time signatures that are present in a landscape to construct a complex language of referents and conjunctions. It is evident when we stop and examine these photographs, that beyond these closely observed details from the landscape, there emerges a portrait of the land as a living canvas of marks, gestures and symbols; teeming with an energy and regenerative vitality that is constantly in a state of flux and renewal. This complexity and allusiveness are the hallmark of Stuart Rome’s photography. The eloquent tracery of patterns and details in these prints resonates with an inner glow and with a draftsmanship that veers at will from lyrical to muted to explosive to capture the varied complexions of the processes at play in the natural world. In order to break out of the purely descriptive limitations of conventional prints, he has even produced a unique silver leaf and digital image print process that creates a shimmering, three dimensional effect on water color paper.